One project was completed and two projects are progressing slowly during this week. 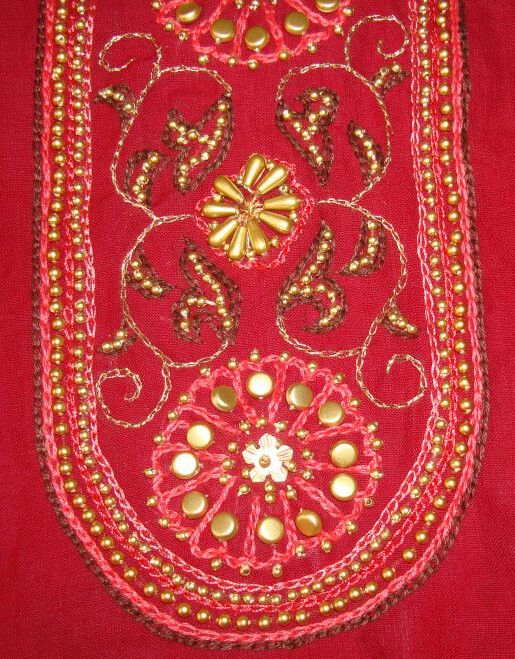 The embroidery and bead embellishment on the centre piece of the red chanderi tunic was completed. I had seen some collections by the designer Sabyasachi Mukerjee. His bridal collections of sarees and lehangas are heavily embellished with sequins and beads. The embellishing part of this project was inspired by this collection. Working on this piece did not sanction much time for sampler book project. But this project being a long term one was supposed to progress on a slow pace. Progress made during this week. After pondering over this sampler book idea for some time has given rise to another sampler book idea on black work embroidery. I have some matti cloth bought in India which is not ideal for any cross stitch or black work projects. I have used them for working TAST samplers. 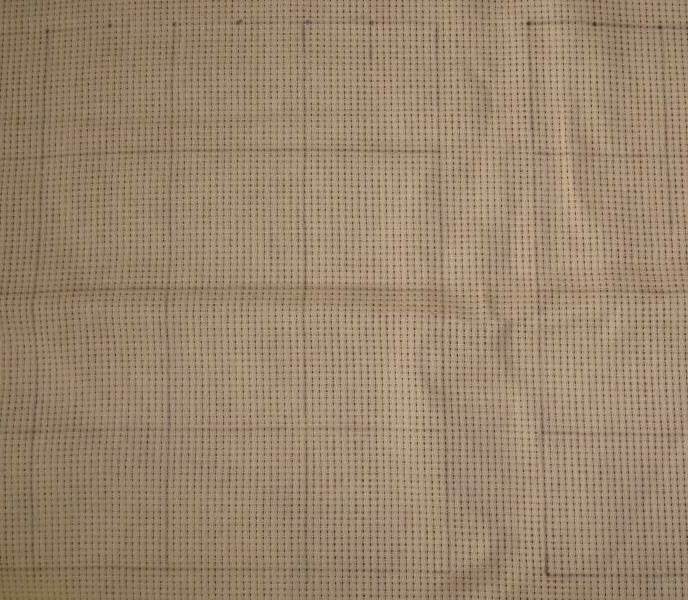 Marking squares with pencil on this cloth was started yesterday. These embroidery exercises are very interesting. I started on the second page on the embroidery sampler book. 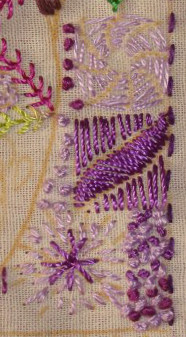 The first detail was worked in detached chain stitches and french knots. 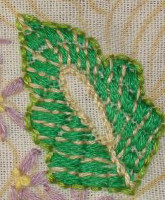 After working a few rows of satin stitches on this leaf motif, back stitches are used to work the outline and the lines on satin stitches. 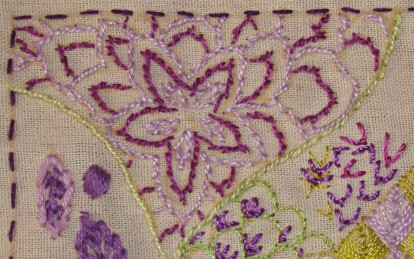 Back stitch is used on this small leaf motif. A little progress was made on this yoke for red chanderi tunic. 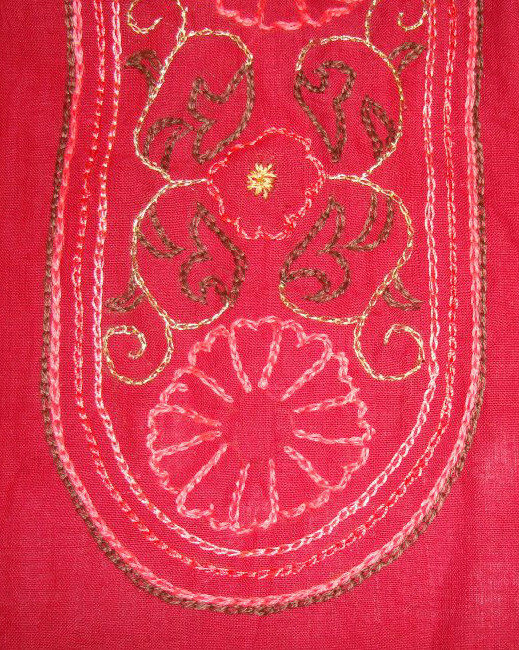 The chain stitches and straight stitches were worked in fine silk thread. The first page on the embroidery sampler book was completed during this week. It is interesting to work these few stitches on this page. Certain details can be taken further. Seven eight details were worked on the first page. I started on the second page yesterday. 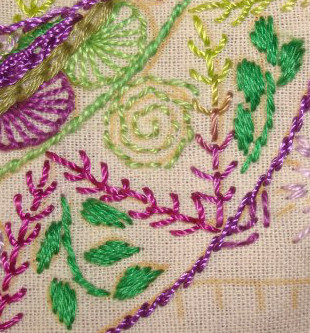 The space between the individual fly stitches ware worked with satin stitch and back stitch stem and leaves. A buttonhole line was embellished with beads and fly stitches in this detail. 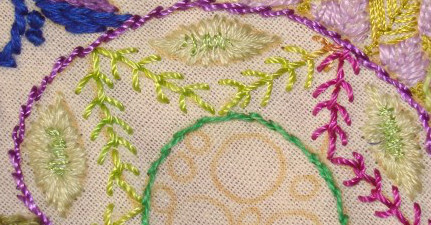 An idea of working fly stitches with beaded long stem was tried in this part. 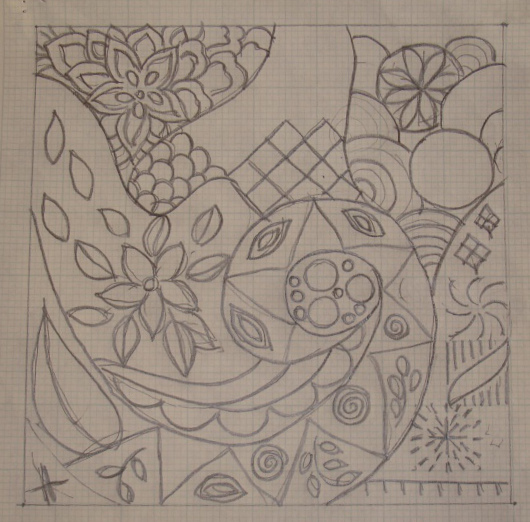 The pattern of the first page. Detailing these embroidery samples on this fabric book is like writing a daily journal. One or two samples are worked and pictures are taken during the day. Evenings are for writing the details. This is the routine. 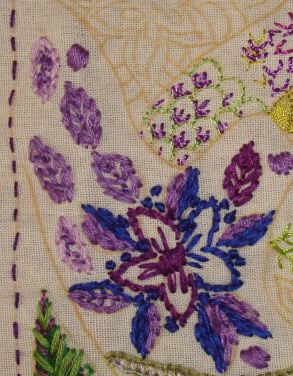 Though the stitches are simple, some focus and dedication are prerequisite for the actual embroidery work. It is really interesting learning like this. 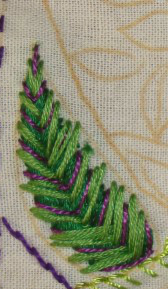 These leaf shapes are worked in satin stitches- with cotton skein and fine silk thread in the centre. 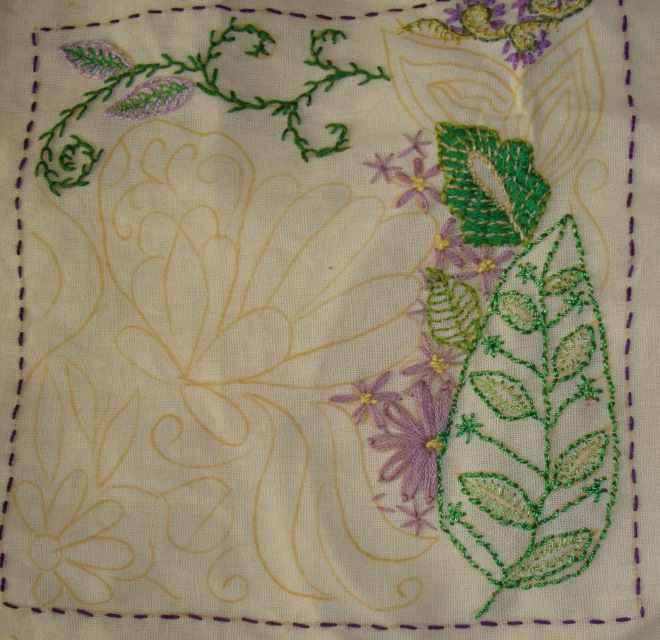 These leaves are worked in satin stitch and stem stitch. Rambler rose stitch and satin stitches are used on these circles inside the circle. Somebody had mentioned that today is world embroidery day. Happy embroidery day to All! In this fabric sampler book, on each page I am embroidering the TAST stitches along with some embroidery samples. 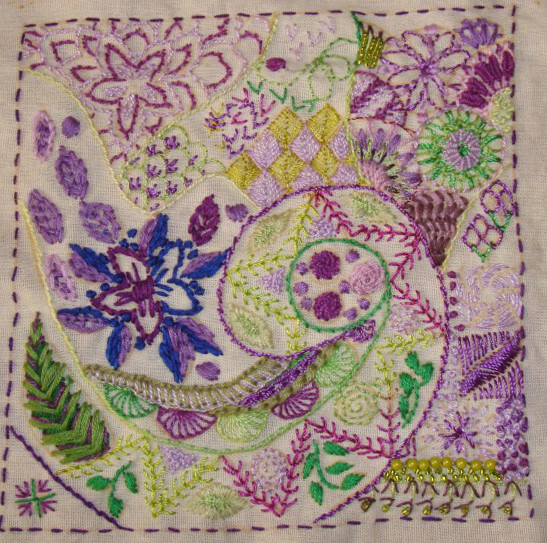 These samples are a record of embroideries I have found interesting on the internet and are some of my own ideas. 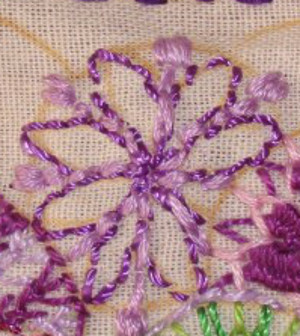 This flower is worked in back stitch and satin stitch in perle cotton #8. 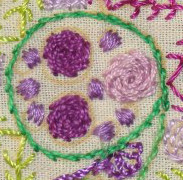 These circles are worked in back stitch with perle cotton#8. After working the buttonhole stitches the space between is filled with chain stitch and satin stitch. these threads are cotton skein and perle cotton. This floral spray is worked with stem stitch filling, fly stitch and stem stitch outline, some seed stitch filling and satin stitches. Straight stitches were added to the satin fly stitched leaf. Some more samples are to be worked in this page.